Plans to build a controversial centre for experiments on monkeys have been shelved by Cambridge University. It has decided the costs, including measures needed to protect the facility from animal rights militants, would make the laboratory uneconomic. The announcement will be a blow to Prime Minister Tony Blair who gave personal support to the project. The centre had become a focus for the growing battle between medical researchers and anti-vivisectionists. The news had been expected next week, but was brought forward. Patients' groups who believe the research is essential to find cures for many brain diseases will be dismayed. The costs of building the centre had escalated from £24m to more than £32m. This was partly down to increased costs for new animal welfare regulations - but the long-term and open-ended security costs were also deemed prohibitive. "We can't afford to build and run Fort Knox," a source connected with the project told the BBC. Pro vice-chancellor at Cambridge University, Professor Tony Minson, said the project would have been financially unviable even without the protesters, because of numerous delays and rising costs. But he added: "It's not the end of studies of the brain in Cambridge and, where it's absolutely essential, we will use animals." Both the Medical Research Council and Wellcome Trust, which were to put money into the facility, said they were looking for ways to continue to fund brain research. 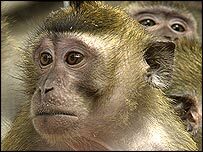 There has been much speculation that the government may try to relocate primate research to its military research centre at Porton Down, in Wiltshire. Director of campaigning group Animal Aid, Andrew Tyler, said testing on animals had become a good way of attracting funding, but was a "defunct methodology". "The proposed experiments have no merit for people," he told BBC Radio 4's Today programme. But chief executive of the Medical Research Council, Professor Colin Blakemore, said the arguments of animal rights activists had played no part in the decision to axe the facility. "They did not win because of logic or the strength of their position. And they will not win in the sense that they will prevent this important research going ahead," he said. Adding that the research would go ahead "elsewhere in the world" if it could not be done in Cambridge, Professor Blakemore said: "We will not be beaten". Local planners had already thrown out the university's request to build the lab because of police fears about public safety. A public inquiry was held after Tony Blair and his chief scientific adviser, Sir David King, intervened - but it also rejected the proposals. Deputy Prime Minister John Prescott then overruled the planning inspector and approved the facility "in the national interest". In January, two animal rights groups lodged a High Court challenge against that decision. Animal Aid and the National Anti-Vivisection Society (Navs) said the determination to allow the project to go ahead was "perverse, unreasonable and unfair". They had also questioned the university's animal rights record and argued the research was meaningless because of the differences between human and monkey brains. "One of the world's leading universities appears to have given into the pressure"